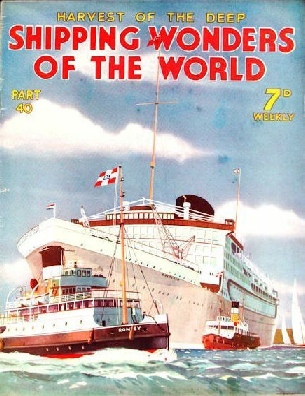 Part 38 of Shipping Wonders of the World was published on Tuesday 10th November 1936. 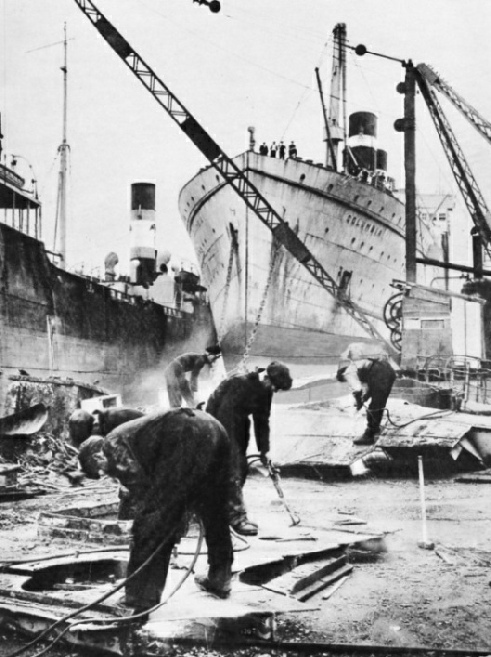 It included a centre photogravure supplement featuring the shipbreaking industry, which formed part of an article with the same title. This week’s cover shows the Rotterdam Lloyd Royal Dutch Mail liner Baloeran landing passengers and baggage by tenders at Southampton, assisted by the tug Romsey. The Baloeran has a gross tonnage of 16,981, and her main dimensions are 551 feet by 70 ft 5 in by 41 ft 7 in. THE ATTACK AT SUNSET. In the foreground is Nelson’s flagship, the Vanguard, with colours flying. 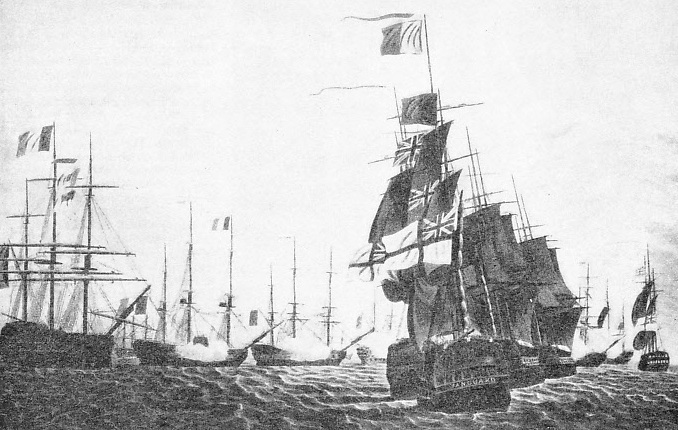 Nelson sighted the French fleet in Aboukir Bay on the afternoon of August 1, 1798. The British ships moved up into tactical positions, and fire was opened at 6.28 pm, shortly before darkness fell. By midnight the victory had been won. The sailing fishing fleets of fifty years ago have disappeared, but the British fishermen still carry on the traditions of their predecessors, though in conditions less exacting. Fifty years ago the fishing fleets were manned by sailors who had no book-learning. Some of them could neither read nor write, but they knew everything there was to know about handling their little craft. The boats in which they sailed were very small and conditions were terrible, lacking all the comforts and most of what we have now come to regard as the necessities of life. Boys who would nowadays be at school went out with the fishing fleet and learned their trade. Times have altered, and with them the conditions of life have greatly changed. Steam came in, and the present-day fishing boat is as different from its predecessors as a modern liner is from the first Britannia. Over 150 feet in length, the power-driven trawler of to-day is clean, comfortable and sanitary. There are four modern methods of deep-sea fishing - trawling, drifting, seining and lining - and these are described in this chapter. The author, Walter Wood, also traces the development of the fishing boats from the primitive vessels I have described to those of the present day. Concluding part (from issue 39) of this chapter by Lieut-Com. E Keble Chatterton. The article is the fourth in the series on Decisive Naval Actions. 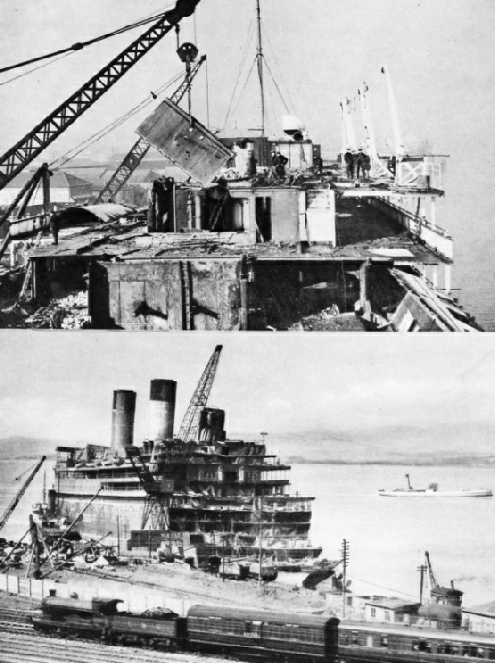 THE AFTER END of a famous battle cruiser HMS Lion. The flagship of Admiral Beatty at the battle of Jutland, she was among the warships scheduled for scrapping under international treaty. She was cut in two at Hebburn (Co. Durham) and the stern part was towed down the Tyne to Blyth (Northumberland) to be broken up. Because of a heavy ground swell, the stern part broke away from the tugs, but it was picked up again, and the destination was reached. The photograph shows the crew hauling in the broken tow-rope. HMS Lion, completed in 1911, had a displacement of 26,350 tons and a speed of 30 knots. She was armed with eight 13.5-in and sixteen 4-in guns, in addition to two torpedo tubes. 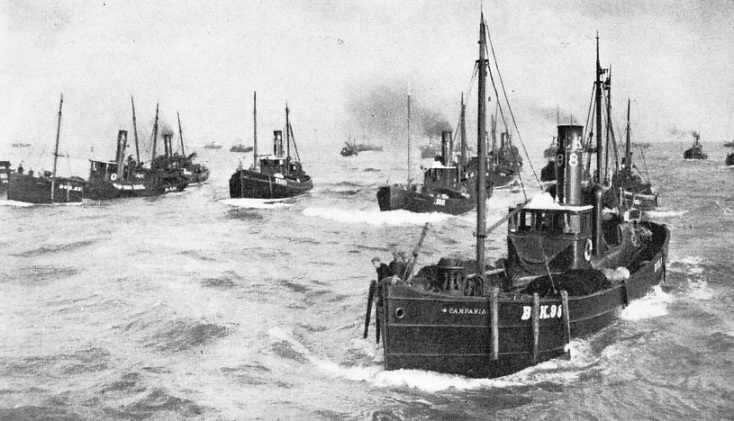 DRIFTERS ENTERING YARMOUTH HARBOUR with their catches. Sometimes the vessels are loaded to sinking point; then there may be such a glut on the market that the herrings have to be taken back to sea and dumped overboard. Many suggestions have been made to prevent such waste of this valuable food. 78 ft 5 in and depth 44 ft 8 in. The San Sylvestre, of the Eagle Oil and Shipping Co Ltd, was built at Newcastle-on-Tyne in 1913. She had a length of 420 ft 6 in, a beam of 54 ft 7 in and a depth of 32 ft 5 in. Her gross tonnage was 6,233. The great South American waterways which rise in the heart of the continent and find their outlet in the estuary serving the capitals of Argentina and Uruguay are of vital importance to the world’s food supplies. The Rio de la Plata was another of those districts that were discovered by Spaniards exploring for a westward route to India. Though they did not find the wealth of the Indies which they sought, they did find riches. They gave the estuary the title of “de la Plata” from the quantities of silver brought down the river from the mines in the Andes. Plata is the Spanish word for silver; it can, of course, be traced in our own language with this meaning. Later on, cattle and horses were brought to the vast stretches of pampas land bordering the River Plate, and the district derived wealth from the export of meat and hides. The chapter is written by Sidney Howard and is the fifteenth article in the series on World Waterways. THE LUXURIOUS MOTOR VESSEL, Ciudad de Concepcion, which operates between Asuncion (Paraguay) and Corumba (Brazil). She is a splendid example of the river craft that work in this region. Her extensive superstructure, where there is spacious cabin accommodation, is largely made possible by the use of specially light steel. She was built at Glasgow in 1930 and has a gross tonnage of 900. Her length is 200 feet her beam 37 feet and her depth 8 feet. This strange-looking craft is non-self-propelling and has no hoppers within her hull into which the dredge spoil can be discharged. Instead it is sent over the side down chutes as the drawing below indicates. She is steam-operated and consists mainly of a boss-shaped hull, with a long oblong slot cut in the forward end. 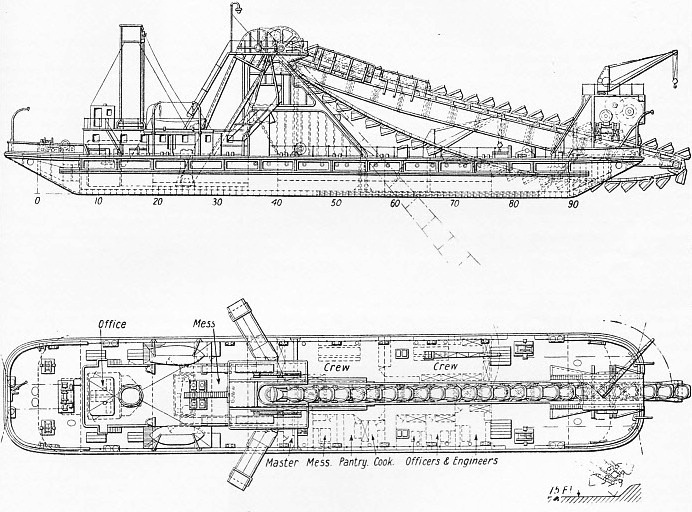 In this the dredge arm, with its endless belt of buckets, moves up and down in a vertical direction, the maximum dredging depth being 75 feet. The heavy dredge arm is hinged at a store slightly abaft amidships and is raised or lowered by special crane gear built over the bow well. The buckets on their belt derive their motion from a reciprocating engine, which is placed amidships in the hull and operates a wheel by chains; the wheel in turn meshes with the wheel operating the buckets. The boiler supplying steam to the reciprocating engine is situated abaft the engine itself. Quarters for the crew are somewhat limited and are arranged in the hull abaft the bow well. This ungainly vessel has to be towed to and from her duty, but when in position can move herself in a fore-and-aft or sideways direction by means of winches on the deck attached to long cables securely fastened to the sea or river bottom by anchors. The vessel has an overall length of 200 feet; the pontoon rate, as the hull is called, is 180 feet between perpendiculars. The moulded breadth is 34 ft 10 in, and the depth of hull 12 feet. The normal dredging depth is 60 feet; with an auxiliary ladder the full depth of 75 feet is reached. This is the thirtieth article in the series on Merchant Ship Types. THREE PRINCIPAL METHODS OF DEEP-SEA FISHING are illustrated here. These are respectively trawling, drifting and seine fishing. 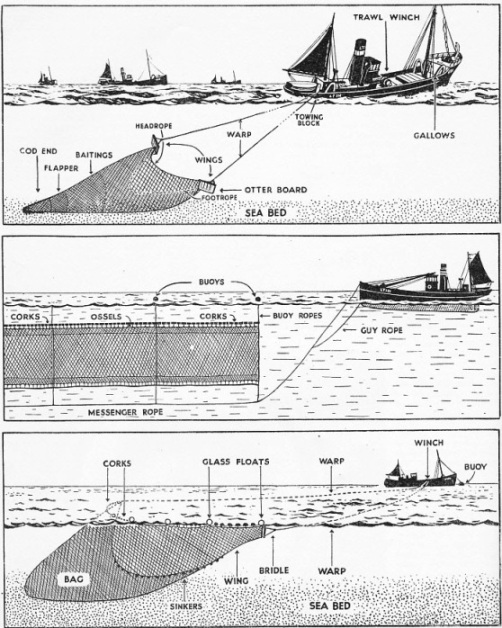 Trawling, as explained in the accompanying chapter, is an active method of fishing, in that the trawler pulls the net along, and this functions in the manner of a tug. For this reason a trawler uses a large-diameter coarse-pitch propeller. The motion of the ship through the water, with the help of the kite-like action of the otter boards, keeps open the mouth of the net, which is divided into sections as shown. Drifting is a comparatively passive occupation; the vessel rides to her nets, which are hauled on board by menas of a steam or electrically driven capstan. The nets are kept hanging in a vertical position by floats or buoys. Seining is of Dutch origin and is really minature trawling. The system is specially adapted to small vessles. A special seine net winch is arranged for pulling the net on board and emptying the fish onto the deck. Seining is generally carried on during summer. The best grounds are those in comparatively shallow water. In the days of the “wooden walls”, a ship condemned to destruction was often burned or even carefully “lost” in some convenient spot. The subject of shipbreaking is tinged with sadness. The thought of a fine ship, known to and loved by many who have travelled in her, being sold to the breakers to be dismantled and scrapped has something of tragedy in it. But no ship can last for ever, and it is perhaps preferable that she should be broken up at home than “sold foreign”. Frank Bowen writes this chapter on shipbreaking. The subject is an interesting one and it is treated in a fascinating way. In the days of wooden vessels shipbreaking was a different proposition. To-day the shipbreaking industry is run on scientific lines, and nothing is wasted. Frank Bowen touches on the historical aspect and also describes the modern methods of shipbreaking firms. Why is it that some ships are broken up and others scuttled? One of the most notable recent examples was the Britannia, the late King’s yacht. 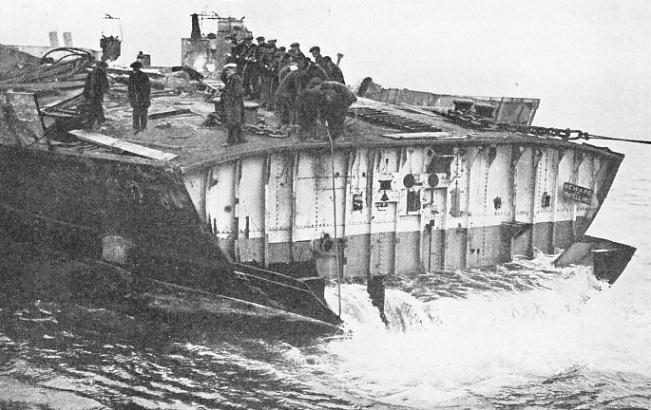 It was felt that she deserved a better fate than the scrapper’s yard, so she was first dismantled of her fittings and then sunk in the English Channel. This happened also to the Australian battle cruiser Australia, but for a different reason. The high cost of labour made it impracticable to break her up in Australia, and it would not have been politic to sell her to another nation. She was therefore towed out to sea and scuttled. ONCE QUEEN OF THE ATLANTIC. 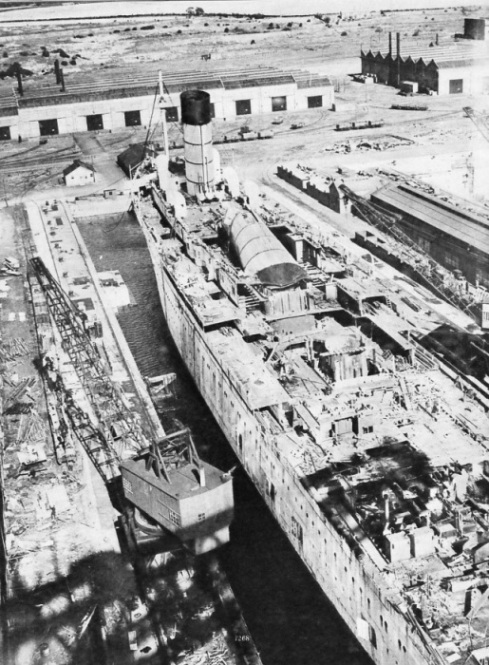 The famous Mauretania, of the Cunard White Star Line, in the dock at Rosyth, on the Firth of Forth. 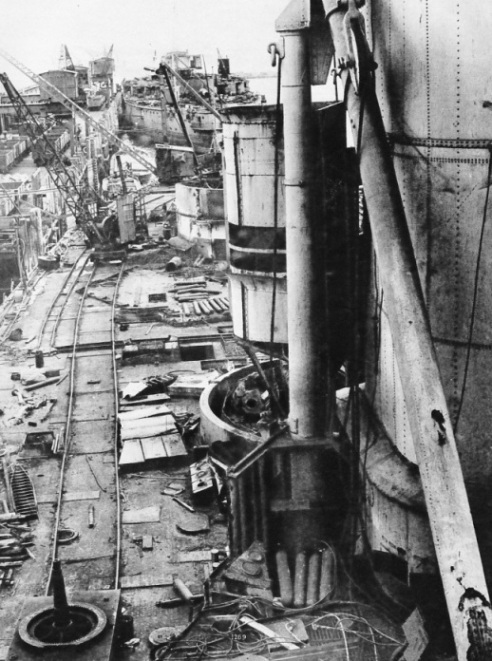 Only one of her four funnels remains in position. Another, just removed, is lying on the deck. The Mauretania, and her sister ship, the Lusitania (torpedoed and sunk in 1915) were built for the Cunard Line in 1907. In that year the Lusitania took the Blue Riband of the Atlantic from Germany with an eastward average of 23.61 and a westward average of 24.25 knots. In 1909 the Mauretania logged an eastward record at 25.89 and a westward record at 26.06 knots. This record stood for twenty years. The Mauretania, built at Newcastle-on-Tyne, had a gross tonnage of 30,696. Her length was 762 ft 2 in, her beam 88 feet and her depth 57 ft 1 in. SCRAPPED UNDER INTERNATIONAL TREATY, two British super-dreadnoughts at Cox and Danks’ Yard, Queensborough, Kent. This photograph shows the deck of HMS Orion, with HMS Erin in the background. The Orion, a battleship of 22,500 tons displacement, was completed in 1912. She carried ten 13.5-in, sixteen 4-in and four 3-pounder guns, in addition to three torpedo tubes. The battleship Erin had a displacement of 23,000 tons was completed in 1914. The scrap price of a warship is calculated at so much a ton displacement. Age has comparatively little effect on the price, but the condition of the plates is an important factor. The Admiralty takes adequate precautions against the divulgence of naval secrets by the sale of ships. 91 ft 9 in and her depth 57 ft 8 in. Passengers in the LMS train, shown in the foreground drawn by an ex-Caledonian Railway express locomotive, obtain an excellent view of the process of shipbreaking. One of the most famous of the Q-ships, though one of the smallest, the coaster Penshurst had a brilliant record of successes before she was lost in an engagement with an enemy submarine. One of the most interesting aspects of the stories of the Q-ships is the rapidity with which circumstances changed for these disguised vessels. However the commander might lay his plans, some unexpected happening would almost certainly crop up, necessitating as often as not the alteration of the whole plan of campaign. In such circumstances, coolness and a gift for forming decisions with rapidity and judgment were what counted most in the encounters between “mystery ships” and submarines. This is particularly well illustrated in this chapter by Lieut Com. E Keble Chatterton, which is the fifth article in the series on Mystery Ship Adventures. The article is concluded in part 41. You can read more about the story of the Penshurst in chapter IX of the author’s book Q-Ships and Their Story. 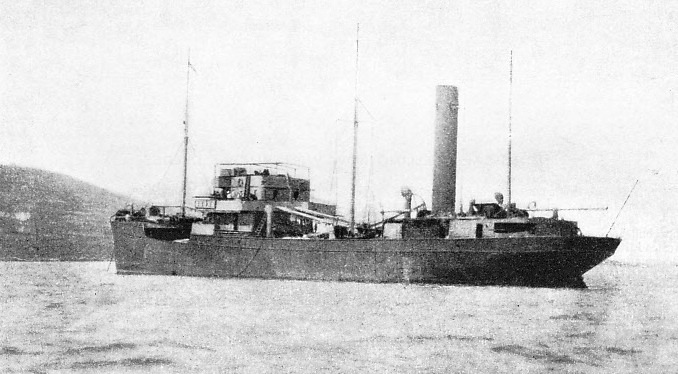 A SUCCESSFUL TRAP-SHIP, the coaster Penshurst, 1,191 tons, commanded by Captain Francis Henry Grenfell RN, accounted for UB 19 on November 30, 1916, in the English Channel. The commander of the German submarine had been deceived by the tactics of the “panic party” and was only 250 yards away when the Penshurst opened fire. In ten minutes the U-boat was sunk.